VQR’s web editor, Jane Friedman, is at Frankfurt Book Fair this week and will be filing a series of dispatches. Read her earlier post, Is Self-Publishing the Most Important Transformation in the Publishing Industry? 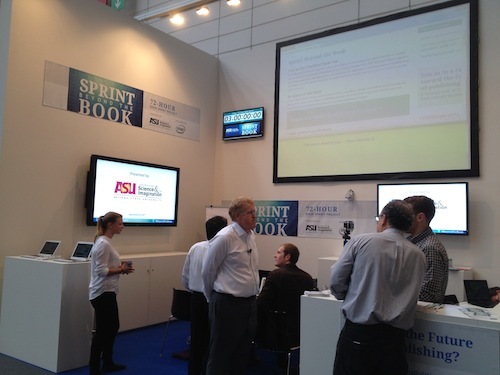 I’m at Frankfurt Book Fair this year because I was invited to participate in a digital-publishing experiment called Sprint Beyond the Book. The goal is to write and publish a book in seventy-two hours on the floor of the show, with the help of attendees and online contributors. The book’s topic: the future of publishing. As unusual as this might sound, the three-day book (give or take a day) has been done before at other book-industry trade shows. For some reason, there is a continuing attraction to publishing things in a really fast and public manner, usually to bring attention to what the future of publishing might look like, and perhaps to emphasize how god-awful slow the traditional process has become (and that it doesn’t have to be that way). There’s something of a publicity game here, complete with a clock ticking down at our booth and on the website, but obviously I’ve agreed to play a role (very happily, I might add), along with other talented writers and thinkers, discussing and writing on the key questions that now face publishing. The common purpose (and the series of mini-deadlines) lends discipline that can be hard to achieve when you’re working alone with multiple ways to distract yourself. Additionally, because I’m sitting around a table with others who have been thinking about these ideas from very different perspectives, I can better understand my own stance and entry point into these questions. Until now, I’ve found it difficult to understand the potential impact of the collaborative writing processes that involve real-time feedback from a team or a crowd. I remember Chris Anderson discussing this process in 2006 at Book Expo America, when he used it for The Long Tail; at that time, it definitely felt like an anomaly, or a process not easily replicated, or even desirable. While we can all benefit from the efforts and results of collaborative writing (hello, Wikipedia), it’s never felt like something that would shape publishing’s future. The younger you are, the more you want to influence the world.…For example, Gangnam Style is a collective thing, is a meme, is very large, and will go away. It doesn’t have staying power. A twenty-year-old doesn’t want to control something; they want to influence something for a week. So that relies on more of a sense of collaboration and sharing rather than ego-control. If you have thoughts on the future of writing, reading, and publishing, I encourage you to submit a contribution at Sprint Beyond the Book. It is open to all. Many thanks to the folks at ASU and Intel for hosting me, as well as my brilliant writing and editing partners: Joey Eschrich, Ed Finn, Dan Gillmor, Lee Konstantinou, and Charlie Stross. You can follow our Twitter stream using #beyondthebook.